The Wenatex business in Salzburg has shown a great level of social commitment over many years and, among other things, offers people with mental disorders regular employment within the company. Wenatex was one of 15 companies to receive a nomination for the Betrieblicher Sozialpreis 2012, which is an award that is presented to companies that demonstrate a commitment toward corporate social responsibility. In collaboration with Pro Mente, the Wenatex company has provided employment to four mentally impaired people since 2010. The re-entry into professional life signals a light at the end of the tunnel for these people, changing their lives in a positive way and gradually putting them back on track. The professional restart provides them with an ideal opportunity to regain a sense of self-esteem and lust for life.The Betrieblicher Sozialpreis is awarded annually to Austrian companies that run particularly sustainable social projects. In addition to personal commitment and sustainability, the imitability of the projects is also a particularly important criterion for the awarding of the prize. Social Affairs Minister Rudolf Hundstorfer currently holds patronage of the prize, which was awarded for the fourth time in 2012. 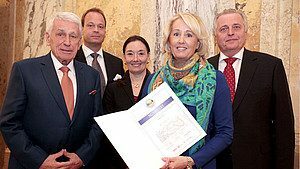 The Betrieblicher Sozialpreis was initiated by the fair-finance association. The initiative is supported by the Austrian Chamber of Commerce, Business Circle and the Der Standard daily newspaper.